Destination marketers across the globe are grappling with how to transform their organizations to meet the needs of today’s consumer. 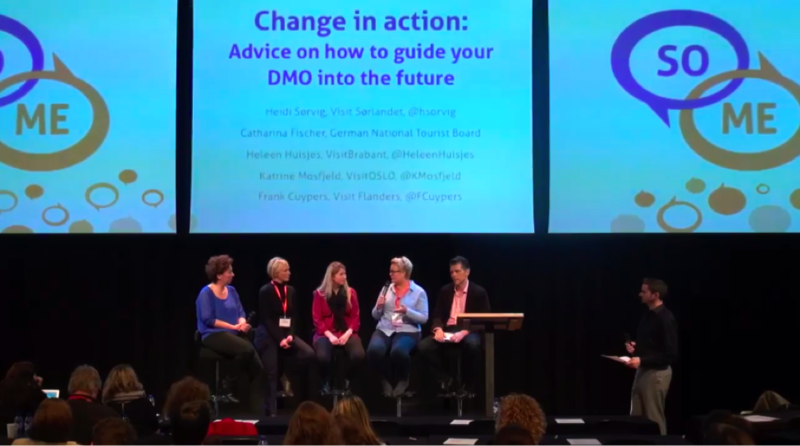 As the industry continues to shift, DMOs are faced with either making a decision to embrace change or to remain stuck in the past. Destination marketing leaders at the 2015 Social Media Tourism Symposium in Amsterdam. Develop a story that is compelling to everyone in the company. – Frank Cuypers, Senior Strategic Consultant, Destination Think! Our city marketing expert Frank Cuypers stressed the importance of creating one consistent message to facilitate change and empower everyone across the organization. Teach this story to new staff, while helping existing staff move beyond outdated ways of thinking. Determining your destination’s DNA enables you to match your messaging to your destination’s actual, authentic identity and purpose. To determine if their team members were the right fit for their evolving organization, VisitBrabant (a progressive destination marketing organization representing a Netherlands province) made current employees reapply for their new job. The organization also hired people from outside the tourism industry to provide a fresh look at its efforts within key sectors, and moved their offices. In all, this helped provide the team with a new outlook and shake off the past, said Huisjes. Speaking openly about your work, including even small niche campaigns, can help support your approach and justify your budget. Fischer explained how her organization also runs internal webinars to help the entire organization better understand new marketing approaches. What’s your top recommendation for destinations undergoing organizational change? Share your ideas below. « Destination funding models: Can the tourism industry collaborate to solve its own funding challenges?